At Total Care Removals, we engage in just about every conceivable type of removal. Sometimes that involves heavy manufacturing equipment typically described as being ‘Plant’. That constitutes some special challenges for everyone concerned and at times the use of some highly specialised lorries, vans and trucks. Let’s take, for example, the movement of a machine that is exceptionally heavy – perhaps weighing many tonnes. In those situations, the basic physics associated with the law of gravity suggests that the last thing you want to be doing is lifting it higher off the ground that is absolutely necessary. If it’s also tall, you’ll want to avoid issues with low bridges so you’ll want to keep it as low down to the ground as possible. 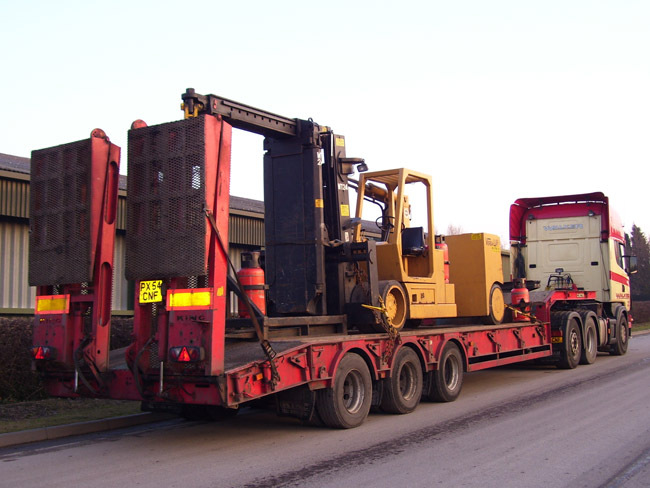 That’s why in some of our specialist plant removals, we will use what is called a low-loader. You’ll recognise those because they typically have a relatively normal height but short platform section at the front of the vehicle but after that the trailer’s bed will ‘step down’ to be relatively close to the road surface. That means that the top of the machine is at a lower height than it would be on a normal height trailer and it doesn’t have to be lifted quite as high to get it aboard. Another situation arises when, for various reasons, it isn’t always possible to evenly distribute the load and therefore weight along the whole length of a trailer. In those situations, you may see what is called a tri-axle truck used. That has three axles at the rear and the heavy machine will be placed on top of them. That thereby distributes the weight across three as opposed to one or two axles. In fact, it doesn’t really matter what the size are complexity of your industrial plant removals, we will be able to tackle them with one sort of special vehicle or another!